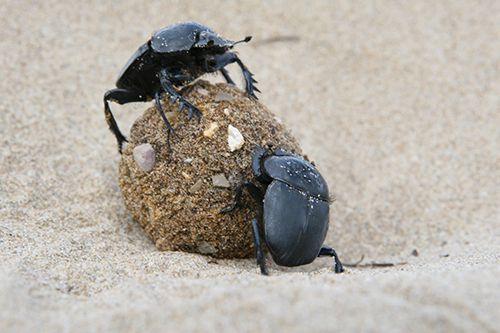 Dung beetles have been found to display distinct behaviours in how and where they lay eggs in dung pats and the conditions affecting this behaviour. Dung beetles (Onthophagus taurus) are commonly known for laying their eggs in brood balls within dung pats. The dung must be sufficiently fresh, so beetles move between pats to find fresh dung. If another beetle finds a brood ball it usually eats the egg inside and lays its own egg in the brood ball, instead of constructing another ball. Thus beetles will often stay near their eggs to guard them. ÂÃÂ from The University of North Carolina and Heather Barker from Piedmont Community College Roxboro (US), published their research in the Journal of Theoretical Biology. They modelled a population of dung beetles that steal brood balls made by others, where the times of arrival and departure from pats depended on strategic choices; the cost of brood ball construction and the ease of finding balls to parasitise. The researchers predicted that beetles follow one of three distinct behaviours: stay in patches for short periods; arrive late and be parasitic; or remain in pats for longer periods to guard their brood balls. The results show that beetle populations consist of the first type only when brood balls are difficult to find; a combination of the first and second types when balls are easy to find; or a combination of all three types when brood balls are very easy to find.